Federation Square is a great place to hang around for a few hours. 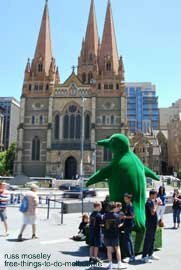 It's opposite Flinders Street railway station and is where you'll find the Melbourne Visitor Centre. It seems to be at the centre of everything that happens in Melbourne. 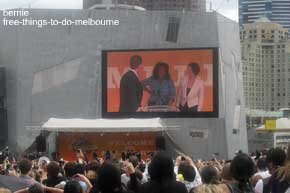 ........Melbourne has loads of festivals and most seem to be around Fed Square. 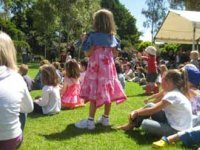 If not, you'll certainly see buskers and there's often entertainment on the stage or on the large screen. There's apparently 2000 events a year here at Fed Square and most of them are free. .......Julia Gillard was there as well but didn't seem nearly as important apparently! I recently saw some of the Ashes (cricket) there too - won't mention the score! ........ 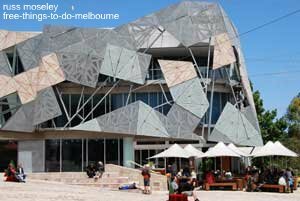 In fact all the buildings in Fed Square are worth a look for their uniqueness. Check out the map below to find where it is.